In doing a roundup of all the aftermarket water pump part numbers I could find, I came across very some interesting results. 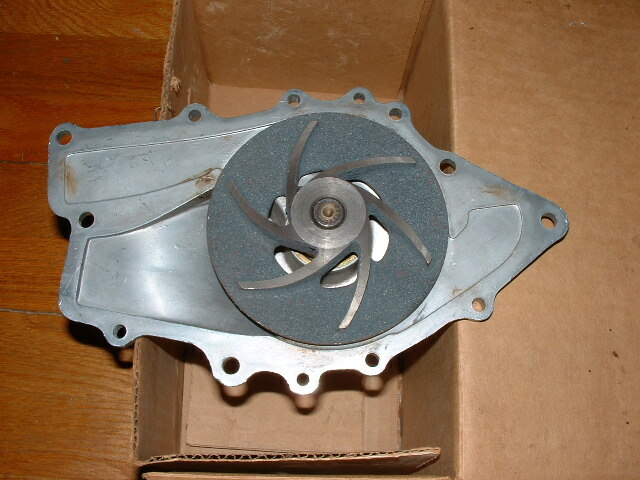 Looking at the pictures off the websites (where available) I eventually noticed differences in the impellers. Some impeller blades are long and go all the way to the edge of the impeller disc. Some are shorter and don't reach the edge. While others are medium in length. Does this have an effect on cooling? Maybe. I would like my blades to be full length. How about impeller blade depth? Some look shallower and some look deeper, it's hard to tell just from pictures. Here they are arranged by tall or short neck. The short ones are for 70 and earlier (I think) and the tall ones are for 71 and newer (I think). If this is incorrect please let me know. The info presented (where available) is: manufacturer name, new or rebuilt, part number, price, and impeller blade length. Prices are from: rockauto.com, napaonline.com. advanceauto.com, autozone.com, oreilly.com . Cross reference information was taken from ASC industries and Airtex Products websites. Note the commonality between different manufacturer's part numbers. All pictures that I found so far were of 5-blade cast impellers, not stamped nor 6-blade. It's interesting that the only short neck pump that I can confirm has long blades is the reman cardone unit, 58111. The later pumps have more long blade units. Six blade is the NON A/C pump. Five blade is the A/C pump. Not sure why some have longer blades. The Non A/C pump has balancer and water pump pulleys almost the same diameter. A/C pump has a large diameter balancer pulley with a much smaller pump pulley. I have an NOS correct p/n pump for my non A/C 67 that is 6 blade. 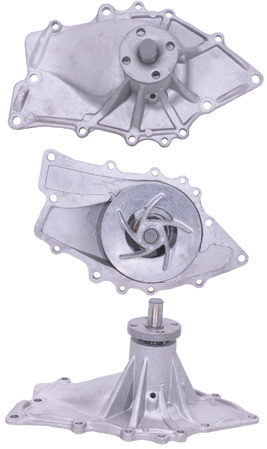 All new or NOS A/C pumps I have gotten during the last 30+ years have been 5 blade. At least the 69-70 Stage 1 cars (and most likely later too) came with HD cooling which was the A/C system. This included the clutch fan, 3 row radiator and the A/C pulleys previously mentioned. Therefore, a Non A/C Stage 1 car would have the 5 blade pump. In 71 the pump length became longer and the pulleys changed p/n. The majority for 71 on up cars had A/C. However non A/C still used the 67-70 6 blade pump with different pulleys. When I get some time, I will list all the p/n's for the pulleys and there application. It is important to use the correct pump, pulleys and year together to get the proper flow and belt alignment. Using A/C pulleys on a 6 blade will flow coolant too fast, and using non A/C ones with the 5 blade pump can cause overheating at slow speed or idle. I tried mixing types over the years and had these problems.